Scientists gather field data on the Greenland Ice Sheet to help verify climate models that are used to estimate future sea level rise and to incorporate the measurements into computer models that will create a simulation of the melt water runoff processes operating on the ice sheet. On Greenland’s ice sheet, a vast icy landscape crisscrossed by turquoise rivers and dotted with melt water lakes, a small cluster of orange camping tents popped up in late July. The camp, home for a week to a team of researchers, sat by a large, fast-flowing river. Just a kilometer downstream, the river dropped into a seemingly bottomless moulin, or sinkhole in the ice. The low rumble of the waters, the shouted instructions from scientists taking measurements, and the chop of the blades of a helicopter delivering personnel and gear was all that was heard in the frozen landscape. This camp was Laurence C. Smith’s field research site in west Greenland. Smith, a professor and chair of geography at University of California, Los Angeles, and his NASA-funded team were studying the hydrology of the ice sheet – how the shifting network of streams and rivers that form during the melt season transport water from surface of the ice to the ocean, contributing to sea level rise. Greenland loses ice to the sea mainly through two processes: the shedding of icebergs from glaciers that run into the sea, and surface melt runoff. The handful of ice sheet surface hydrology studies have mostly focused on Greenland’s massive melt water lakes, which can disappear in a matter of hours, engulfed by the ice. But Smith and his team believe that rivers sinking into holes in the ice are the main agent transporting water from the top to the bottom of the ice sheet. “While lake drainages do suddenly pump a large volume of water all at once to the ice sheet, in fact the amount of water they put into the ice sheet is almost trivial compared to the flux of water moving through these intricate, very efficient drainage networks [of rivers] that spread across the surface of the ablation [or melt] zone each summer,” Smith said. Besides contributing to sea level rise, melt water runoff also accelerates ice loss: when the water percolates through the ice sheet and reaches the rock below, it slightly lifts the ice, helping it flow faster toward the ocean. Also, the intensity and area of surface melt are projected to increase with climate change. The increase in resolution of satellite imagery during the last decade has allowed researchers to better map melt water rivers and identify good candidates for field research. 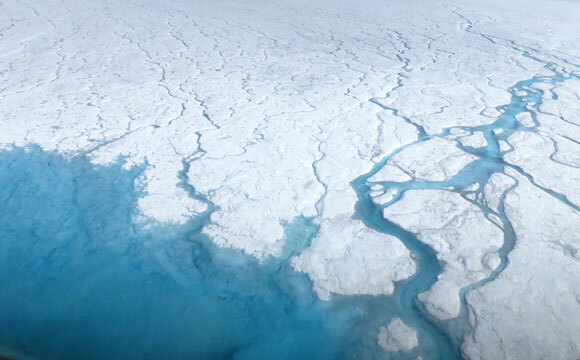 Still, it is logistically very challenging to set camp on the melt zone: the National Science Foundation coordinates the transport of equipment and personnel to Greenland. Then, all researchers and tools have to be helicoptered in from the nearest town off the ice sheet – in Smith’s case, Kangerlussuaq, in western Greenland. Researchers often have to move camp, since the melt quickly makes everything too soggy. More importantly, the scientists go to great lengths to ensure safety: were anyone to slip and fall in the frigid waters, he or she would be quickly swept away into the moulin without any possibility of rescue, disappearing forever. For this reason, researchers must tether themselves to ropes when working near the rivers. The moulin near Smith’s camp drained a catchment, or single network of streams flowing to a river, encompassing about 27 square miles (70 square kilometers) of the Greenland ice sheet. As the river by the camp approached the sinkhole, its waters deeply cut into the ice walls and carved a steep canyon. The team had marked the limits of no-go zones with bright orange tape, confining their data collection to a safe flat riverbank. Still, the researchers were roped in to avoid falls while they moved back and forth across the waters an instrument called an Acoustic Doppler Current Profiler, which bounced sound waves through the waters to measure the depth and velocity of the river’s flow. Further upstream, Smith deployed three autonomous drift boats equipped with GPS and several other sensors. As the instruments floated down the river, they transmitted via satellite their coordinates, plus temperature data and depth measurements taken with sonar, until they were swallowed by the moulin. The data will allow researchers to calculate the volume of the water entering the sinkhole. Smith’s team will use the field measurements to calibrate remote estimates taken by satellites, such as the twin satellites of NASA’s Gravity Recovery and Climate Experiment (GRACE) and the commercial WorldView spacecraft, and aircraft missions such as NASA’s Operation IceBridge. The field data will allow researchers to verify the simulation of regional climate models used to estimate future sea level rise. They will also incorporate the remote and field measurements into a computer model to create a simulation of melt water runoff processes operating on the ice sheet. On July 19, Smith’s camp on the Greenland ice sheet had visitors: researchers Marco Tedesco, an associate professor at the City College of New York, and Tom Mote, a climatologist at University of Georgia. The two scientists were taking measurements of the albedo (the ability to reflect sunshine) of the basin. Albedo changes during the melt season because melt makes the snow and ice crystals grow and become less reflective. At the same time, dark material such as soot, dust and biological material is darkening the surface of the ice. The darker the ice, the more energy it absorbs, which leads to more melting. From the helicopter, Tedesco and Mote were flying the prototype of a new spectrometer – an instrument that measures the intensity of solar light: first pointing it at the sky to calculate how much sun radiation was coming down, and then downward to see how much energy the ice sheet was absorbing. The researchers were also collecting geo-located, very high-resolution images from a digital camera mounted under the belly of the helicopter. Mote, Tedesco and Smith’s research is only a portion of the complementary research that NASA is funding this summer in Greenland: the agency provides funds for dozens of projects that look into factors such as the role of warming ocean waters in melting glaciers from below, or how the land rebounds as it sheds ice. All of them with an ultimate goal: to increase our knowledge of how fast and how much Greenland will impact sea level rise in the upcoming decades. Be the first to comment on "NASA Continues to Research Greenland Ice Sheet Melt and Sea Level Rise"